For over 20 years, Dr Rob Phaal has been leading research at the IfM into how organisations can use management tools, including roadmapping to build flexible and effective management systems. Below he lists seven ways an organisation can improve their approach to roadmapping, providing an excellent foundation for planning strategic technology and innovation activities. Avoid a big organisation-wide launch of your roadmapping activities. Instead start quickly, test and tailor the approach, deliver value, get buy-in from key stakeholders and build momentum and the ambition to implement roadmapping across your organisation. 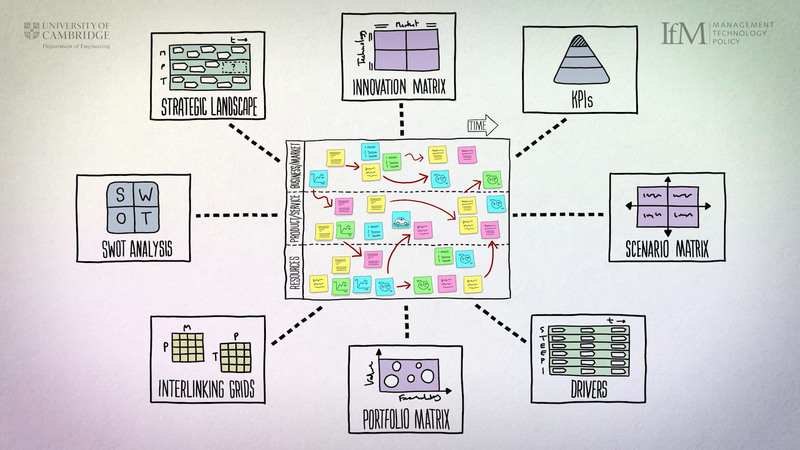 This ‘agile’ approach avoids the danger of over complicating and bureaucratising the process, which is a common pitfall and barrier to wider adoption. IfM advocates a fast-start workshop approach to roadmapping for the rapid initiation of the process in an organisation. Participants will be able to put forward their views and have their input recognised by their colleagues in a mutually stimulating multifunctional environment. The group will go through a process of inquiry and consensus building, leading to outcomes that are shared across the organisation. Participation of key stakeholders increases the level of commitment for implementation post-workshop. Wokshops can range in size - for example we facilitated a one-day roadmapping workshop for the National Physical Labratory, with 89 participants from across 44 organisations taking part. Make sure the activities you put in place give ample opportunity for the generation and capture of information, data and ideas to populate the content of the roadmap, making the most of the valuable workshop time. increasing the breadth and depth of inputs so that facilitators have the opportunity to filter and iterate the inputs/views, sometimes uncovering issues below the surface. preparing participants to start the interactive sessions at the workshop events, including priming their thinking on future challenges and reflection on current issues. giving stakeholders space to thoughtfully generate their perspectives (as opposed to providing potentially rushed real-time inputs during the pressured environment of a workshop). Read the paper 'Customising and deploying roadmapping in an organisational setting: The LEGO Group experience' by Clive Kerr, Robert Phaal and Kasper Thams. One of the most powerful aspects of roadmapping lies in its visual approach, so paying attention to the roadmap structure, visual clues and guidance, the timeframe and more will help guide the facilitator and participants when building their vision for the future. 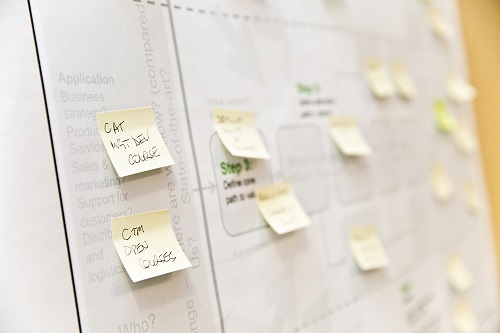 The design of a roadmap framework and templates can have a significant impact in delivering on the objectives of your workshop, organising the dialogue, with all participants empowered to contribute with the aid of post-it notes in a self-documenting process. In 2016 we conducted a study to test the performance of roadmapping templates for early-stage technological innovation in collaboration with a company in Sweden. Two templates were tested – a ‘classic' template and a new 'self-facilitating' template which included process steps and annotated guidance that a facilitator would normally provide. Compared to a conventional style classic template, the new self-facilitating template performed significantly better on all measures: completeness, consistency, quality and ease of use. Read the paper 'On ‘self-facilitating’ templates for technology and innovation strategy workshops' by Robert Phaal et al. We have a bank of templates available to download for free on our website. When designing the template, make sure the timeframe is right for the areas of focus. The ‘right’ timeframe on a roadmap will depend on which industry or system you are looking at. In fast-moving sectors, such as software or electronics a short timeframe will be appropriate, whereas roadmaps for aerospace or infrastructure will be much longer. For many organisations, a timeframe of about ten years will be typical, allowing for longer term trends and drivers that affect the topic to be represented, together with the timeframe needed to commercialise new technology. The past: The past can be useful in drawing out key influences and events that have led to the current situation, highlighting learning points that will influence the success of future plans. The short term (typically a one year horizon): This part of the roadmap is the most important aspect of your roadmap as it will be transformed into the tangible plans and actions needed to implement strategy. Consider it as the ‘budget horizon’ since resources will need to be allocated to enable actions to be fulfilled. Medium-term (typically three years): Highlighting broader direction and options that influence the short-short term decisions and plans, providing a bridge towards longer term goals and aspirations, typically aligned with organisational strategy. Long-term (Typically a ten-year timeframe): Setting out the ultimate quantified goals and objectives in line with the vision or aspirations of the organisation. Key uncertainties and scenarios should be articulated, and long-term shifts in the technology, business and market environment explored. This acts as a ‘radar’ enabling longer-term issues that affect current decisions to be captured and assessed. Vision: It is useful to set out the long-term aspirations of the organisation, including its mission, providing a ‘beacon’ to head towards. Often these aspirations can then be translated into firmer, quantified goals, targets and milestones in the short-, medium- and long-term, creating ‘stepping stones’ that lead from the current situation to the desired future state. A key principle for tool development at the Centre for Technology Management (one of seven principles of tool development) is where workshops are facilitated, facilitators should be neutral making no direct contributions to the content. Facilitators should add value through carefully planning to make sure the method is appropriate (design of visual templates and using appropriate tools) and working to make sure the right people are involved since “success is largely determined by the active involvement of those participating” 2. 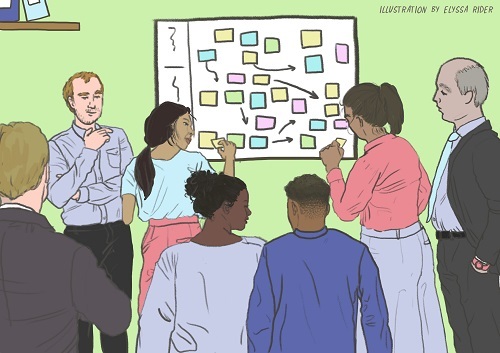 When these two elements of the roadmapping process are right, facilitators will find that their role during the workshop is mainly focussed on pacing the activities and discussions, freeing up time to deal with strategic issues arising. The structured visual templates provide a platform for self-organising the process so that much of the activity including reflecting, questioning summarizing with be self-sustaining, with participants empowered to contribute through the use of post-it notes in a self-documenting process. Roadmapping offers even more power when it is used in combination with other business tools and we recommend that its used as a central ‘hub’ to which other tools can easily connect. The power of its underpinning framework (Why-What-How-When-Where-Who) provides the basis for collecting stakeholder input and interactions and reflects well-established models for strategic planning. From this information, areas of weakness, gaps in strategy and knowledge may be revealed, and so you will need additional tools to support the broad range of decisions that are associated with strategy and innovation. For example, scenario planning can be used to explore the longer-term future, were uncertainties are high and you want to explore the implications of decisions and actions made today. Find out more bout how roadmaps can link to other strategic tools.